I was a very late convert to the merits of a salad. Because, you see, a good salad is not a simple thing. It is something that requires an understanding of flavours, texture and balance. It is a culinary dark art. In her book, The Art of Simple Cooking, Alice Waters (the undisputed Californian queen of the Slow Food movement and – probably – all salad matters as well), makes clear that salads are anything but – for Alice, every ingredient must be tasted and individually seasoned before being allowed into the composition. Restaurants do salads very well. They have this technical cookery nouse plus lots of fancy ingredients lying about the place that can be knocked up into something really very good. But, unless you want to eat the same salad (or a variation thereof) every day for a week, it is difficult to make a great salad at home and not end up with odd leftovers that end up going off. But my enigmatic employment status and childcare obligations mean that I am mostly at home for lunch these days and so it was time to get a grip and find some alternatives to peanut butter on toast, which didn’t involve cooking (not on the cards after toddler lunch at noon). Thus began my mission to find some simple but exciting salads, using seasonal vegetables rather than a bag of mixed leaves and a tomato. Naturally, I looked to Nigel Slater. Because what that man doesn’t know about a vegetable is really not worth knowing. And because most of his recipes have 43 fewer ingredients than those of Yotam Ottolenghi – whose mind-blowing salads might otherwise have been an obvious place to start. This is a perfect winter salad – something really colourful and refreshing when all you’ve eaten for months is casserole and carbs – but UK beetroot should be around for another few weeks at least so I am still classing this as ‘seasonal’ (let’s gloss over the local seasonality of fennel shall we?). Beetroot is rather good for you – it has a unique group of antioxidants called betacyanins, which we are told support liver function, strengthen the heart, purify the blood and are anti-inflammatory. It also contains potassium, magnesium, iron, vitamins A, B6 and C, folic acid and soluble fibre. All marvellous – just a shame that it has something of the compost heap about it, which had pretty much limited my previous dalliances with it to the pickled variety and a beetroot chocolate cake that didn’t really set the world on fire. But when raw, cut thinly and paired with the right things, that earthiness is offset by a lovely sweetness. Fennel too is another vegetable winner – full of potassium, tons of vitamin C and good for the digestion in a gripe water kind of way. Peel and finely slice the beetroot. I peel raw beetroot with the back of a teaspoon – the old trick for peeling root ginger – and it works rather well. (Do wear those disposable kitchen gloves that are unhappily reminiscent of custom officers and cavity searches, if you have them. Or use just yellow beetroot or those beautiful Chioggia ones if you really hate the Lady Macbeth look). Top and tail and then finely chop the fennel and keep the fronds. Do not add to the beetroot until everything else is ready as the colour will start to creep into your lovely milky white green fennel. I used a mandolin to slice both as its quicker and you can get really thin slices but a sharp knife would definitely do the trick. Make your dressing: whisk together the sour cream and oil. Season. (I used crème fraîche as I didn’t have soured cream so whisked it with a fork until thin enough to dress the salad and added a little lemon juice). 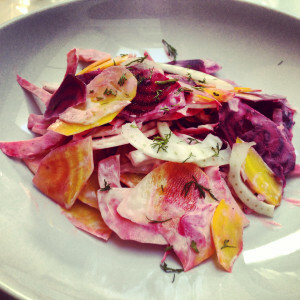 Assemble the salad: CAREFULLY combine the onion, beetroot and fennel with the dressing. The colour from the beetroot will run very easily so try to toss quite carefully if you want a lovely photo for your Instagram page/are serving this as a starter for some posh friends. Otherwise, knock yourself out and throw it together however you like. Although these diary products are not strictly interchangeable (particularly when cooking with them as you can end up in curdling hell) for this recipe – as they are being using cold – I think they can easily be substituted provided you adjust the seasoning accordingly. Nigel directs that the sliced onions be soaked in red wine vinegar for 20 minutes to soften the raw onion harshness. If you don’t have time to do this you can just pour boiling water over the onion slices and then stick them into some cold water for 5 minutes or so. (This is what I do for salsas etc. and it works fine – you may just need to add a little vinegar or lemon juice to the dressing to compensate later as some of the vinegar flavour is meant to be imparted to the onions from the soaking process). I ate this, as Nigel suggests, with some Speck from our local deli because I am a firm believer that there is nothing in this world that is not improved by some salty pig product. But I am not going to pretend that is especially healthy. A great (and vegetarian) alternative would be to top with walnuts (Omega-3, Vitamin E – hello!) or hazelnuts. Some dill sprinkled on top would also be delicious, as would some watercress if you wanted to bulk it out with some greenery too. Ditto sliced apple. In keeping with the winter theme, oranges (especially blood ones) would make a brilliant addition, but in which case I would drop the soured cream and take the dressing in a more traditional vinaigrette (with some walnut oil?) or citrusy direction, which would give you a great vegan option (and which I suspect would make a great side for salmon – smoked or seared – albeit decidedly less vegan at that stage). I have been contemplating whether the traditional goat’s cheese/beetroot thing would work here and while I think it would be great with the fennel, I am not convinced the soured cream dressing would gel that well – if goat’s cheese is what you fancy I would probably ditch this dressing in favour of a lemony vinaigrette. This fennel and pear soup by David Lebovitz is so tasty you won’t remember it’s really healthy and, if made with olive oil rather than butter, completely vegan. I left out the cider and just added more stock. Oh, and it freezes really well too. And as for beetroot? If all else fails, roast or boil it and then peel, chop and pickle it with some chopped shallot and equal parts vinegar and sugar. You’ll be thankful of it next time you have smoked salmon. Or some salty pig product. I am very much with Homer (and the old Kate) on salads. Fine on top of a burger (as long as there is not too much lettuce) but never a meal in itself. It is always so hard and cold and there is always a risk of running into a piece of fruit or a nut in there, neither if which have any place in a savoury dish. But the colours are very pretty.